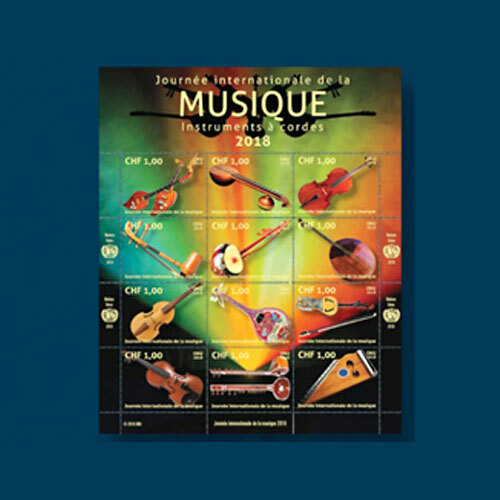 The UNPA released three panes of stamps to celebrate International Music Day on 1st October. Each pane consists of 12 se-tenant stamps featuring musical instruments. The stamps released for the UN post office at New York features brass and woodwind instruments. One stamp depicts a flute and clarinet. The other stamps feature saxophone and brass instruments. The pane of stamps for the UN post office in Geneva features string instruments while the ones issued for Vienna post office feature percussion instruments. Each pane has a different header, depending on the type of instruments. The header for the pane issued for New York is in English, that for Geneva is in French and the header for Vienna pane is in German. The stamps were designed by Sergio Baradat of the United Nations. They were printed by offset lithography and hexachome by Joh. Enschede. 18,000 panes of 50¢ stamps; 19,000 panes of 1fr stamps; and 24,000 panes of €0.80 stamps were released. International Music Day was established in 1975 by the International Music Council. Founded in 1949, the council is non-governmental advisory body to UNESCO on topics related to music. It is a membership-based professional organisation that promotes the value of music worldwide. It also works on upholding basic music rights in all countries.